McDonalds Japan will be offering four new versions of their “Quarter Pounder” burger starting next month. Only one of the new burgers will be available at a time though. All four of the new burgers are known as “Big America burgers. 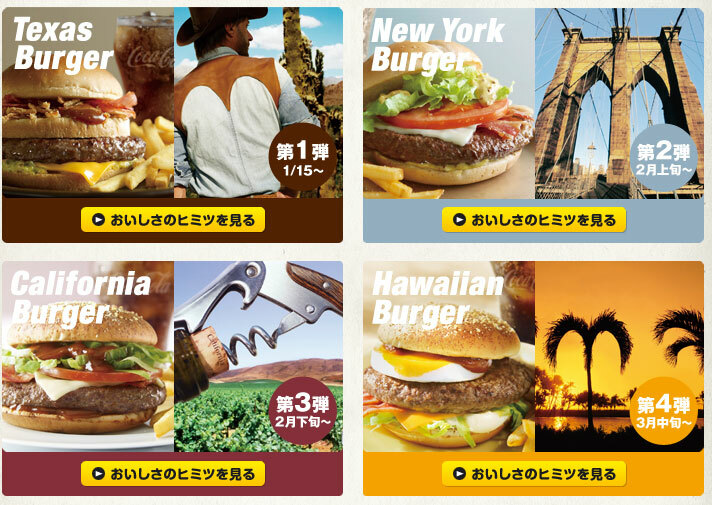 And individually they are: “Texas Burger“, “New York Burger“, “California Burger“, and “Hawaiian Burger“. The first of the four that will be available is the “Texas Burger“. It will be available starting on 2010 January 15. It has bacon and BBQ sauce. Next will be the “New York Burger“. It will go on sale in early February 2010. It’ll be like a BLT meets a Quarter Pounder“…bacon, lettuce and tomato on the burger. Then in late February 2010, the “California Burger” will be the one available. It’ll have Monterrey Jack cheese. And finally, in March 2010, the “Hawaiian Burger” will be on the menu. It’ll have a egg and is called a Hawaiian Loco-moco style burger. 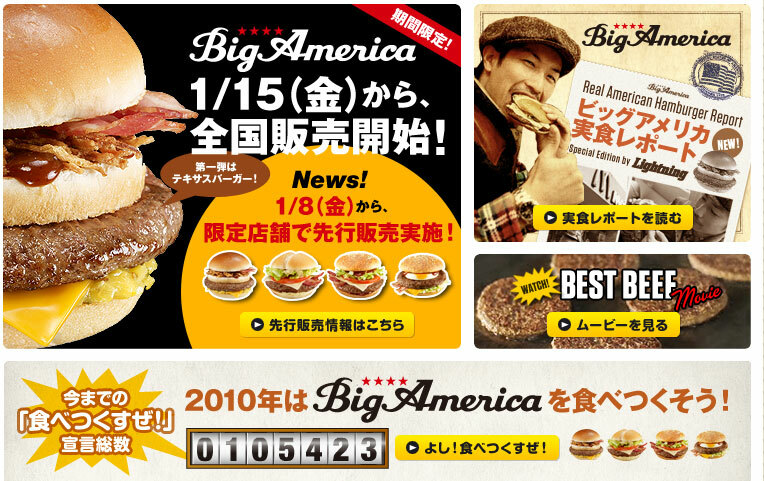 On the McDonalds Japan website, visitors an click a button if they intend to try all four of the Big America burgers. When I checked the site, it said that “105,423 people will try all four burgers“. To me, none of them sound all that special. I don’t think I’ll buy any of them. How about you? Which of them sounds good to you? Would you try all four? Are these burgers available at McDonalds in your country…or is it only in Japan? Anyways, the Xmas decorations went down yesterday in Japan and were replaced with the traditional Japanese New Years decorations. New Years is Japan’s biggest holiday. Here’s a New Years window display at a store that my family and I went to today. “Big America”? Figures….ha! Oh well…at least the game didn’t feature a ballooning American! Anyways, it was fun–I got 15 “Burger Points”, 8 fries points, and 3 drink points. The drinks were hard to lasso. >I can’t tell you the last time I ate at McDonald’s or BK. I can say that it has been years, though, and I remember feeling sick afterward. Don’t you like fast-food? That’s healthier not to eat it. I don’t eat fast-food often…but I do like it. I agree w/ Gigi, the Hawaiian burger should have pineapple! I loved the pineapple burger at Wendy’s earlier this year! I’ve never heard of “Loco-moco”, why is it Hawaiian? None of them sound very exciting to me, I’ll probably just stick w/ my all time favorite Teriyaki burger! >I’ve never heard of “Loco-moco”, why is it Hawaiian? “Loco-moco” is a dish that is very popular in Hawaii. It’s rice, hamburger, egg and a sauce. So, this Hawaiian Burger has all of the Loco-Moco ingredients except rice. BTW, how come you haven’t updated your blog in a while? I’m not a big fan of egg on a burger. The Cali burger sounds good. I’d be all over the one with egg. There’s a restaurant I used to go in Seattle that served a burger with bacon, egg, cheese and a turkey patty. Delish! You’d choose the Hawaiian Burger? I like a soft-boiled egg with Japanese noodles. You should try it. I don’t like egg on my burger. A Hawaiian burger should have a slice of pineapple! But it’s supposed to be “Loco Moco” style…which, I believe, has egg and burger but no pineapple. Do you like “Loco Moco“? There’s none of those promotions offered over here so I guess its only in Japan. 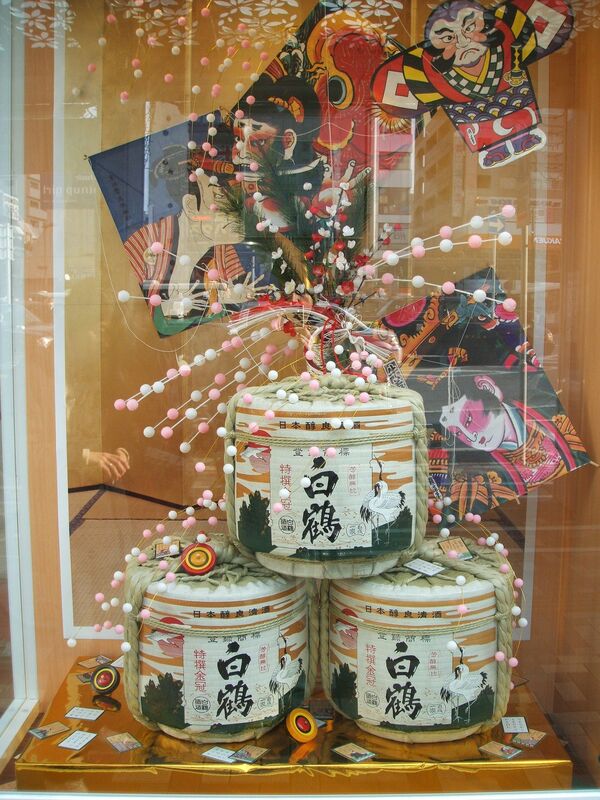 I like the Japanese New Year’s decoration but out of curiosity what are those jars for ? (Is it correct to call it ‘jars’?) 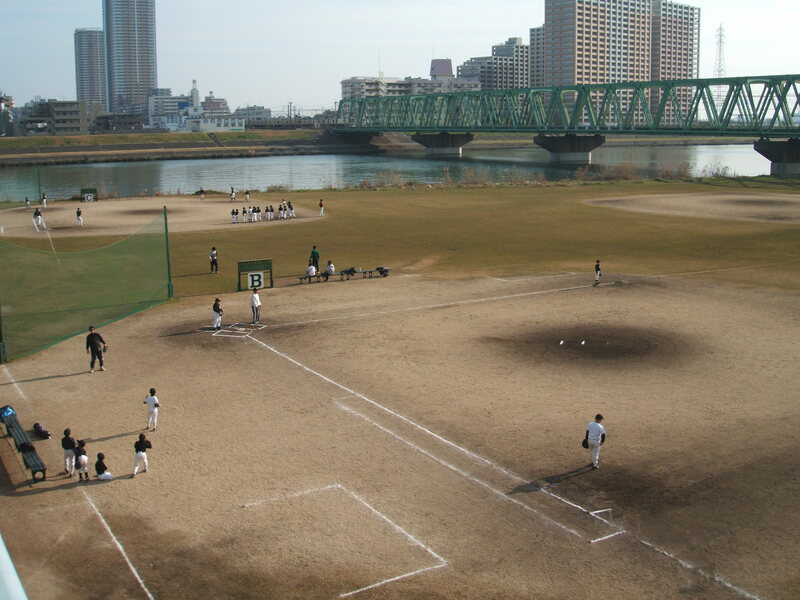 Ahhh baseball those are the days when I used to watch that alot on the telly, over here its softball that they play and my youngest brother is a big fan for both baseball and softball and is one of the players for the National team …the fella practically eats, sleeps, speaks softball or baseball ..
>There’s none of those promotions offered over here so I guess its only in Japan. Do any of those burgers look good to you? >what are those jars for ? Those are barrels of 日本酒 (Japanese sake alcohol). They sure look good to me ..especially that one with the Monterey Jack cheese..the California burger ..
Yeah, I might get one of those in February. It looks the best of the four.